This fall the MSU Center for Western Lands & Peoples and the Gallatin History Museum will present “Memories and Legacies of World War I,” a series of events to commemorate the 100th Anniversary of the Armistice--the end of World War--which took place on November 11, 1918. In 1954 in the United States, Armistice Day became Veterans Day to honor American veterans of all wars. Events will begin with a discussion of Vera Brittain’s Testament of Youth. All are welcome to join the Friends of MSU Library Book Group on October 9 at 6:30 pm in the Bozeman Public Library to discuss this Englishwoman’s memoir of her years as a hospital volunteer in the war that killed her brother and sweetheart. On October 10 at 6 pm at the Museum of the Rockies, Todd Harwell with the Montana Department of Public Health and Human Services will present a lecture, “’No More War, No More Plague’: The Spanish Influenza Pandemic Toll on Montana.” On October 17th at 7 pm the 2018 documentary “Hello Girls” will be shown in Reynolds Hall on the MSU. The film chronicles the experiences of women who served as telephone operators in the U.S. Army Signal Corps and then fought for sixty years to gain veterans’ status. On October 24, the public is invited to the Gallatin History Museum for a reading of poetry inspired by the Great War and a closing reception for the Museum’s exhibit on World War I. On November 7, MSU faculty member Dale Martin will give the lecture, “False Armistices: War’s End and Disputed Aftermaths” at the Museum of the Rockies at 6 pm. Families are welcome to a free day at the Gallatin History Museum on November 10 from 11-3. The focus will be on “Animal Heroes,” with activities designed to teach visitors about the crucial roles animals played in the war. Live animals will be on site. 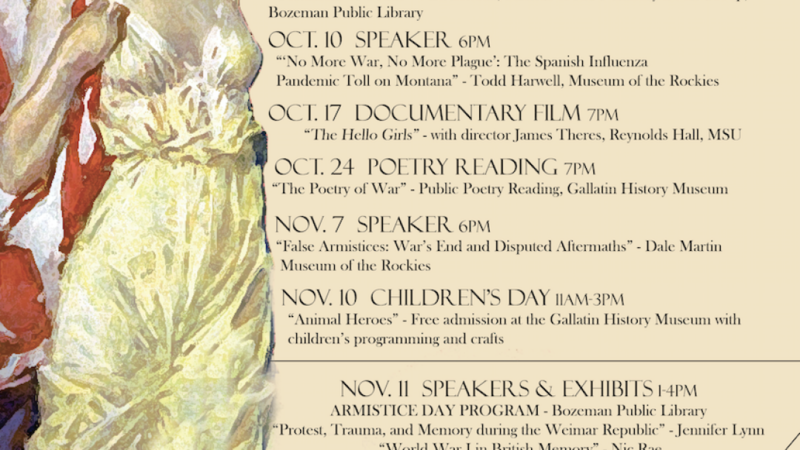 Events will conclude with a program at the Bozeman Public Library on Armistice Day, November 11. From 1-4 pm a series of speakers will discuss the effects of the war in Gallatin County, the role that wheat played in the Great War, and how the war has been remembered in Germany and Great Britain. The Museum of the Rockies and several individuals will have artifacts from the Great War on display, and we encourage the public to bring any mementos or objects they have. Historians and curators will be available to talk about the materials of the Great War. Exhibits can be viewed through November at the Gallatin History Museum and the MSU Libraries Special Collection. Additional community support is being provided by MSU Library, the Bozeman Public Library, MSU Department of History and Philosophy, Bozeman High School, and the Museum of the Rockies. All events are free and open to the public.